Corrie ten Boom and her family are masters of their craft; they repair broken watches and return them safely to their owners. But as the evil of World War II sweeps through their city, a new kind of ?watch? comes to their care: an innocent Jewish baby, desperately needing protection from the cruelty of the new Nazi regime. How will the ten Booms keep this baby and many others out of harm?s way, and what will be the cost of serving God amidst unthinkable evils? When faith is tested, hope is tried and love is strained, will Corrie?s God prevail? See her amazing story of courage, sacrifice and forgiveness anew through this gripping episode of The Torchlighters. Torchlighters is a series of animated programs for youth ages 8-12, presenting the lives of true-life heroes from Christian history. When kids see what God can do through a ?Torchlighter? who is devoted to carrying out His will and purposes, they too may want to carry a torch of faith by serving Him. 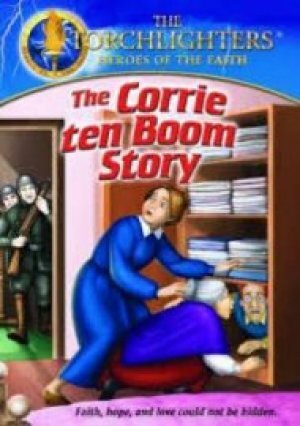 Torchlighters: The Corrie Ten Boom Story DVD by Torchlighters was published by Vision Video in November 2013 and is our 1797th best seller. The ISBN for Torchlighters: The Corrie Ten Boom Story DVD is 727985015385. Be the first to review Torchlighters: The Corrie Ten Boom Story DVD! Got a question? No problem! Just click here to ask us about Torchlighters: The Corrie Ten Boom Story DVD.